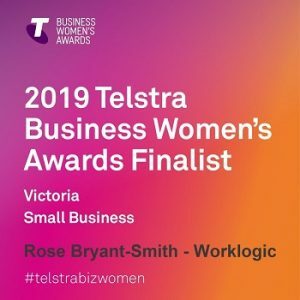 Please join us in congratulating Worklogic’s Rose Bryant-Smith on being chosen as a finalist for the 2019 Telstra Business Women’s Awards! Rose’s selection reflects her incredible achievements as an Australian leader in resolving workplace complaints and promoting a positive culture at work. Rose is a respected voice of integrity and ethical leadership, a best-selling author on team dynamics and workplace investigations, and a serial innovator. “I’m so proud of what I’ve built with Grevis and the Worklogic team since 2007 and it is lovely for this to be recognised by the judges, ” Rose said. The Victorian winners will be announced at a gala evening on 14 March.